I don't give to charity. I give to change. I work for change. I support change. And the most important work in our communities, nation and world. 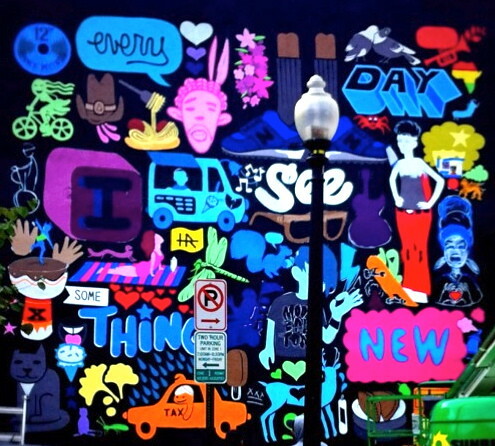 I give to hope for a better world, for the discovery of cures and creativity and aid. I give in thanks for the abundance that my life has afforded me and for the privilege that I walk through this world with. I give in ways that provide funding for causes I believe wholeheartedly in, and I strive to vote with my dollar and put my money where my mouth is. I give because I walk the talk, and because I know I am part of the change we wish to see in the world. As the holiday season approaches, in my mind I hear the death march in the background. The crass commercialism, the attempts to over dominate with one religion all others, and the out of balance beliefs that more equals love and we must go in debt to pay for holiday gifts. All these things grate on my very last nerve. But after an amazing year, I'm filled with inspiration of the possibility of a country waking up from an oppression by the 1%, and seeing the light bulbs go off over their heads as so many move their money from Big Banks to their local economies. I'm inspired by the countless hours my friends volunteer for causes they passionately believe in, and for the work every one of my clients does to make things better for women, girls, the LGBTQ community, our nation's health, our reproductive health and rights, those who are developmentally disabled, and our libraries. So. Lucky. So lucky I am to live this life, in this world. And because of these things I give. To change, to hope, to miracles, to hard work, to compassion, to determination, to getting it done. Non profit organizations are here for us this time of year to honor and celebrate our place in the world. I hope you can be inspired by the world around you and give to the organizations you admire and want to see continue. I hope you'll give—to hope, to change, to others. It's a lot more than "charity." 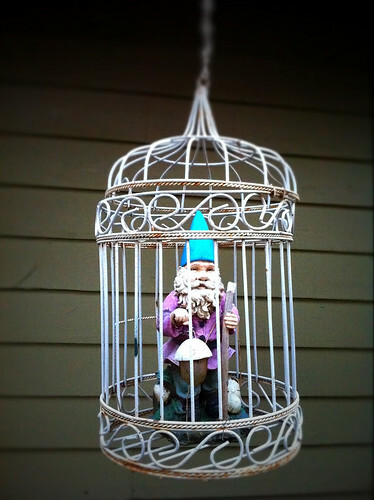 Someone has been a very bad gnome and is in gnome jail for the winter. In other gardening news, we did some garden fall clean-up this weekend, getting a head start on next spring's clean-up. I think it might have been the first fall clean-up in our garden in years. Usually I leave things for the birds, but this year, I don't know what's in me. This morning we have a truck full of debris AdRi is dropping off at the dump, and the front yard actually looks presentable. The vegetable beds are tucked in for the winter, and all of the solar lights and lanterns are filed away in the garage until next year. Seriously, pinch me. It's a rare year. 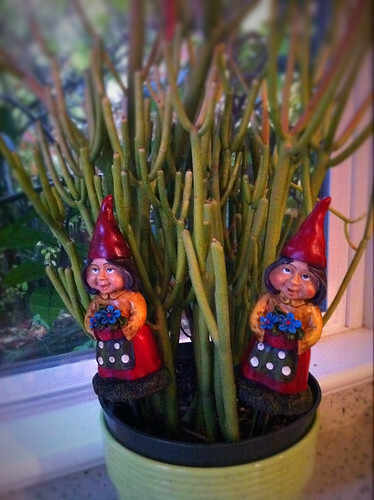 Perhaps the gnomes inspired us. Oh and hey! My column in Just Out is on winter hiatus, but I did write a little recommendation on a recent book I loved, The Bucolic Plague by Josh Kilmer-Purcell of The Fabulous Beekman Boys. You can read it here. 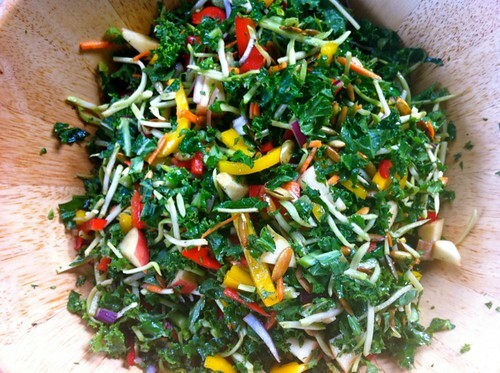 Designing salads as a feast for the eye and for the mouth: kale salad! I know it sounds like such a cliche: feast for the eyes. But I've been playing with this theme for the past several months, and designing meals for beauty on the plate is really fun, and super healthy. As a visual designer, I love the challenge of hitting different notes of the color wheel, and where I've embraced this the most is in salad creation. Who knew that I'd come to love kale as much as I do? Sometimes I even crave it. I know: crazy. What can I say? If anyone has an I Heart Kale bumpersticker, you know who to send it to. Wait. Of course there's an online generator for that. Here you go: But a big part of what I love about kale is its ability to hold up in a salad, and to even get better the second day. 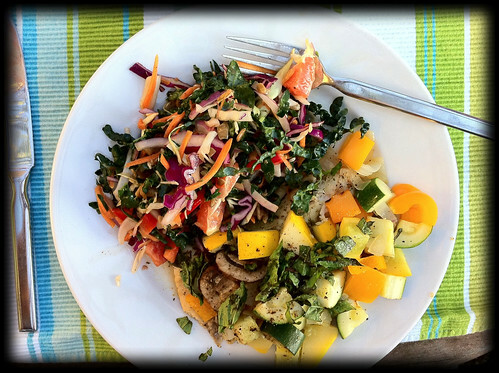 Combine that deep green with other colors from the rainbow and you are guaranteed to have a plate full of vibrancy and health. I like having an acidic dressing because it helps to break it down a bit, and if you chop chop chop the kale, you have really palatable bits to chow down on. I don't have a strict recipe to share with you, but instead a technique to follow, allowing for creativity and working with what you have or what's in season. Let's start with the kale. Lacinato kale, also known as dinosaur kale, is usually my kale of choice. (Good kale reading here!) 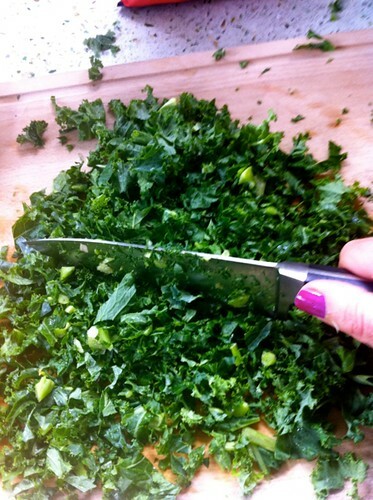 Start with a big healthy bunch or two, rinse it thoroughly, then using two fingers, strip the center stem, leaving long strips of kale from either side to work with next. Pile all of the strips up, and chiffonade or chop it up. I like to sing the Choppin' Broccoli song while doing so. Don't ask why, I just do. Also, if you want to save some time, Trader Joe's sells big bags of washed and prepped kale, leaving you with only the chopping to do: sweet! Use a few or a lot of the ingredients listed above. I always include shredded carrot in mine, but everything else is up for grabs. In a mixing bowl, throw in a big dollop of dijon or flavored mustard. Add to that a big squeeze of honey if you want some sweetness, the juice of an orange (fresh makes a big difference in the brightness of flavor), and a good splash and a half of vinegar. I like balsamic, but have experimented with apple cider, champagne, or flavored vinegars (like blood orange). Grind enough black pepper into the bowl until your arm tires, season with sea salt, an mix it all up. You don't need oil in this, but if you want to, you can always whisk in some good olive oil. Taste for flavor, then toss toss toss with your salad. Toasted pumpkin seeds or sunflower seeds can add some texture to finish off your salad. Then keep in the fridge a big container of this salad and enjoy on day 2 and day 3. The acid of the orange juice helps break down the kale, softening it a bit but never leaving it mushy. The more you experiment, the more you'll get comfortable changing ingredients up and trying new things in your mix. But following the practice of creating a bowl of beauty is always a winner in my book. Just a quick note to my Portland-area readers (Holla! Portland! Put a bird on it!) Is it time to clear out your closet and make way for some new things? Are you holding onto some workplace clothes you really aren't wearing anymore? If your answer is yes, join me in donating gently used clothes to women who can really put them to good use, through Dress for Success, a fantastic organization providing access to office-appropriate clothes for low-income women trying hard to make it in the workplace. A friendly recently visited Dress for Success and discovered they have very little clothing for women with curves, meaning size 14 and up. So extra kudos to you if you're able to help in this department. I have six huge bags of clothing to donate and I'm so happy to be able to make sure they go to women who can really benefit from them, including the fantastic leather coats I'm letting go of. This Saturday I've joined with some friends to host a clothing get-together for Dress for Success and I wanted to let my readers know how to help. Bring your clothing donation—purses and jewelry are also accepted—to Cupcake Jones this Saturday, November 5, between noon and 3pm, say hey and get a free cupcake! And just think: with all of the space you create in your closet, you're opening the window to filling it with something new and wonderful. I love that feeling.